Suggested planting rate: one plant per 1.5 ft/sq. 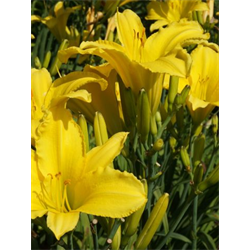 Notes: Use Erin Prairie daylily bulbs as a naturalizing plant, a groundcover, in formal sweeps, or as a focal point in the perennial border. Also, consider planting over and around spring-flowering bulbs to hide the bulb's foliage as it matures naturally, while adding late spring and summer color.